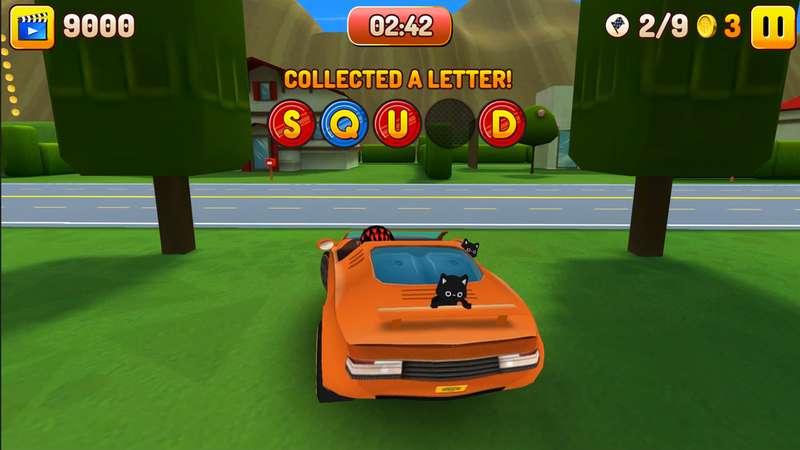 Choose your driver and car, hit the road at intense speeds and do neck-breaking stunts and tricks! Rev your engine and unleash its incredible power before hitting a jump and flying through a giant donut in the Stunt Jump Hunt! Hunt down the five letters, free the animals from their cages and find the lost kitten on every level. ▸ Incredibly realistic and fun 3D car physics! Do crazy jumps and drive cars that feel REALLY good! ▸ Complete goals to unlock new levels, earn coins and points! ▸ Several awesome cars to choose from! Each one is carefully optimized and comes complete with fluffy, ultra-kawaii animals poking their heads out of places they really shouldn't be! ▸ Simple controls, easy to pick up and play - challenging to master. Comes with touch controls and some limited gamepad support (Apple MFi) at launch. 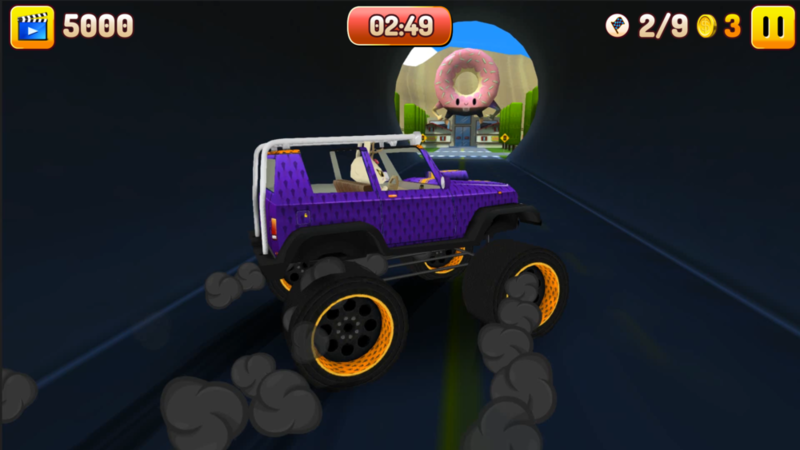 ▸ Record and share your most insane stunts with the world on YouTube, Facebook and Everyplay! ▸ Free and (and most importantly) FAIR to play! Complete goals to unlock levels or buy them right away with purchased coins. Earn coins by playing the game, so you can buy cars and upgrades. ▸ Apple Game Center support (iOS). Earn every achievement in the game and try to get to the top of the leaderboards! ▸ Metal and 64 bits support means extra graphical improvements for the latest Apple devices! ▸ iCloud support for saving your progress and playing across Apple devices! ▸ All money earned from in-app purchases and advertisements go to supporting my family. So in other words; DIAPERS! Lots of them, and I mean a lot! Oh god. So...many...many...diapers. Please be advised that it is possible to make In-App Purchases within Animal Drivers and that there are advertisements shown. If you have any problems running the game, please describe the issue, which device you’re on and the OS version to lordvard@hellobard.com. Thank you for your patience and support in making this a great game for everyone playing. Press kit with logos, screenshots, gifs and a ridiculous photo of Bard can be downloaded here. You made this game alone? Lord Vard: I contribued too. I drew a picture of a pig! ....It didn't make it into the game. What kind of games inspired Animal Drivers? Bard: Visually and in terms of style, I have this crazy crazy love for "Zelda: Windwaker" on Gamecube. It's just perfection in terms of stylized 3D. When it comes to gameplay I liked the free-roaming gameplay ideas from GTA and also the goal systems used in extreme sport games. Like do all these goals within a certain amount of time, but do them however you want. Lord Vard: I like Diablo. And Hello Kitty Birthday Adventures. Bard: I used Unity 3D to make the game itself, along with a plugin called Edy's Vehicle Physics for anything car-physics related. Everything in the game is modelled/rigged/animated in Autodesk Maya, and every single texture is hand-drawn in Adobe Illustrator. The latter is so ridiculously time-consuming! Bard: Money? What? I work for the Norwegian state, I don't have any! Lord Vard: Funny story, we actually stole money from poor peasants and drunk men what fell asleep on trains! I personally stole also candy from at least five babies and sold it through a fence at a middle-school. Wait, should I be admitting crimes in a public interview? Why do you have a weird PR alter-ego? Lord Vard: I am here to handle all kinds of gamer gates. I feed on hatred, vitriol and disgusting comment fields. Please email me at lordvard[at]hellobard.com if you have something truly despicable to say about Animal Drivers. I'm here to listen!